Subsequent to the community engagement workshops that we had written about in the earlier post, the next stage of the design thinking process involved testing the prototypes that we had built based on our interactions with the residents. Taking the key issues that emanated from the workshops as inputs, we created these prototypes to provide future scenarios of the area to the residents. The prototypes were built on top of the existing layout of the area and provided a visual representation of each model and its features and was also accompanied by a video walkthrough of the models. The models incorporated these issues at different levels keeping the constraints of the geography in mind. Selecting a particular model involved a trade-off that the citizens had to choose from: for instance a choice of wider road would leave out the provision of private water supply in the region or choosing a park facility would leave out provision for a local community center & clinic. We made 5 models of the region that we have detailed in the presentation below. In addition we made a sixth one that we called the “pre-empathy” model (Model 6) that we had built based on our own understanding of the region and the surveys that we had initially done. The idea was to test whether this pre-empathy model holds good against the one that the citizens eventually select post the engagement workshops. In addition all the models were built such that if the residents participating in the Test Workshop had any feedback or wanted to make any changes, we would be able to rapidly prototype the models and show it to them at the workshop itself. The test workshop had 8 participants who had volunteered to be part of the exercise. Our local team walked the participants through each model and highlighted the trade-offs that each model represents. Largely visual and involving a video walkthrough of the region, the models drew a lot of curiosity amongst the residents and they understandably had many questions about the trade-offs. Later participants were encouraged to freely walk around the hall that had pictures of each of the model pasted. Subsequent to which they ranked the top 3 models according to each of them and points were allocated based on their rankings. From amongst the voting, Model 1 emerged as the preferred choice – Single Storey Houses (For thatched houses in the area), Closed Drainage Network, Narrow road, Private water supply, Library, Anganwadi, Clinic, Ration shop, Multi-purpose hall. What was interesting is that the “Pre-empathy” Model (Model 6) emerged as a close second in the voting. The reason when probed turned out that people felt since the model involved an immediate replacement of thatched roofs with roof tiles, the model looked most feasible in the short-term. In terms of refining the model per se or having any particular feedback that we could incorporate and rapidly prototype on the go, participants didn’t have any particular suggestions apart from indicating the addition of streetlights in the model. Towards the end of the workshop we conducted an “exit interview” survey which was aimed at assessing their understanding of the process, their satisfaction as well as their level of ownership over the most popular design alternative. All the eight participants expressed a high level of satisfaction with the design process, out of which six of these expressed a strong willingness to participate in such design efforts in the future. And importantly, all 8 participants expressed a strong willingness to work with the Municipal Corporation to ensure that the final design would be implemented. The selected model (Model 1 in this case) was supposed to be shown to a second group of residents who had not been part of the entire process. The intent was to show them only one option and get their reactions to it. 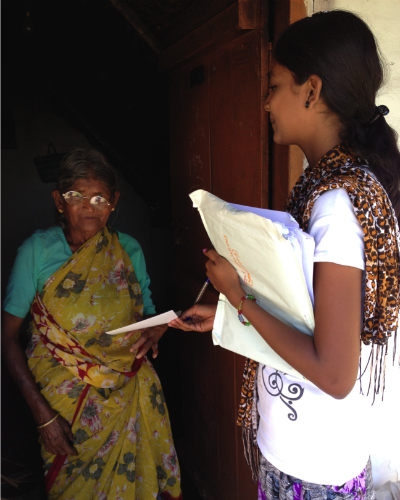 However none of the residents showed up for the workshop, prompting our local team to visit them at their doorstep. While the second group expressed satisfaction about the selected model, several indicated that they do not believe the Municipal would actually implement the design and also were not willing to take ownership of the project unlike the earlier group. A significant amount of time during the process was spent on empathising with the community and that has resulted in a better understanding of the community and its various nuances. Such prolonged period of empathising and later through a series of build-up initiatives aimed at drawing increased participation from the residents has resulted in participants indicating higher levels of satisfaction with the process and expressing their willingness to take responsibility of the final model. However there are few lessons that we have learnt along the way and believe that they hold important inputs for someone undertaking such a process. During the course of our process we visited the area at regular intervals and coordinated with our local team to execute the different phases of the process. An approach where we had stayed there for a longer duration and had relied on a more experienced local team, whose members had prior experience in carrying out such community engagement efforts, may have yielded additional insights. Also engaging a few local residents to be part of the local team that is executing the process would have also been helpful. The iterative approach of the process allows for the residents to suggest suitable changes to the prototypes and rapidly see those changes reflected in a revised model. However in our case the residents had suggested only one change so there was not much iteration, as we would have liked. This though was not entirely unanticipated. Being a small area of 75 households, allowed us to get granular with the needs and aspirations of the community during the empathy phase, thus enabling our initial prototypes to essentially capture the key issues of the community. However in case where the process is implemented in a bigger area where there are large communities, multiple iterations of the prototype would be very crucial. Additionally the prototypes that we showcased, though were largely visual and appealed to the residents, it would have been interesting to allow for such visualisation techniques where prototypes are more responsive and allow the residents to themselves experiment with the models in real-time. Overall the design thinking process provides an interesting approach to infrastructure planning where the needs and aspirations of the citizens are the basic starting point upon which solutions are subsequently built and iterated upon through their consultation. The lessons that we have learnt in executing the process in Srirangapatna could act as a valuable guide in applying the “Design Thinking” process in an urban planning context. What are the things you want to preserve in your area? What are the things you want to change in your area? What are the things you want to create in your area? Answers to these questions, which were mapped to each household, provided the starting point for the engagement workshops that followed. To make the discussions both engaging and manageable we conducted a set of 3 workshops. One of the most critical components of the workshop was the local team that was going to execute this. 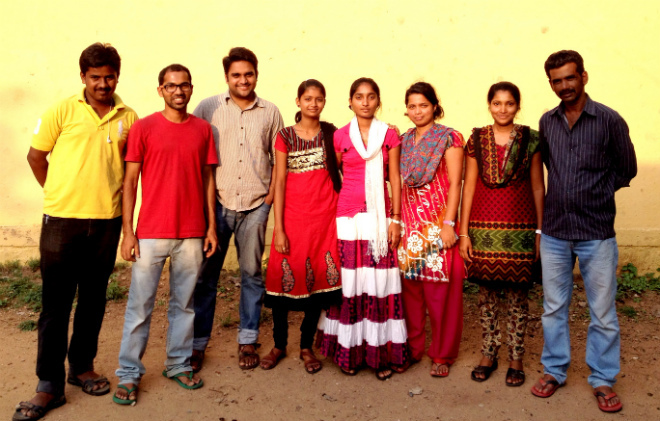 We had engaged the same local team of students that we had trained for both the surveys and the outreach exercises. Preparing them for the workshops involved running them extensively through the process and detailing the different facets of skills that might help them in having better conversations with the citizens. This endeavor proved to be a lot more challenging than we had initially envisaged, something we will cover upon in our next post. 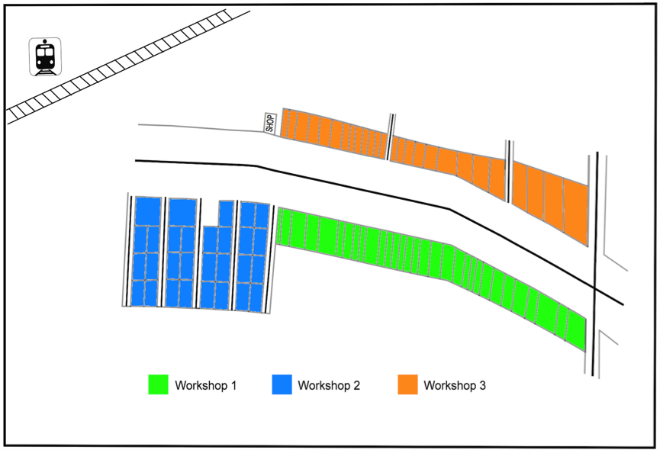 Each workshop was planned for a 120 minute duration overall and was split into 4 phases. The intent was to initially set the context and have the filled-up vision sheets of each household be the starting point of the entire workshop. From amongst the local team of students we had designated a particular individual to play the role of a Lead Facilitator who was tasked with making the initial introduction in the local language, summarizing the process so far and laying out the agenda for the workshop. The Lead Instructor also encouraged the citizens to freely express their opinions and why such participation will play a pivotal role in designing the future of their community going forward. The rest of the team of 4-5 individuals (called Group Facilitators) was designated to specifically handle individual groups that were formed. As the citizens arrived for the workshops they were each given their respective vision sheets and were organized into small groups of 5-6 people. The intent of the first activity was to get each citizen in the small group to talk about what was there in their respective vision sheet with other members of the group. Once the group had heard each member out, the designated Group Facilitator prompted the group to deliberate on some key issues that they believed were critical for their area’s future. At the end of the discussion each group member would list their top 3 issues. The Group Facilitator would write these issues on a chart paper visible to the entire group. The issues were then put to vote whereby each member was requested to vote on the top 2 issues from the lists of their peers. Once the points were collated, the top 3 issues from each individual group was ranked and one representative from the group presented to all the workshop participants about what their group believed are the most critical issues. After each group had made its presentation, an overall list of issues/aspirations across groups was compiled and put to a final vote to arrive at the top 5-6 issues/aspirations that the entire workshop participants believed are critical to their area’s future. Once the top issues were identified the participants were merged into larger groups to discuss the identified issues in greater depth and how best these issues could be addressed. The idea behind this activity was to capture any local information or knowledge that could be best leveraged in subsequent planning and was thought of as an ideal way to rely on citizens themselves to come up with solutions for issues they had collectively identified. Our hypothesis was that when solutions germinate from the citizens themselves, it would encourage greater ownership of the solutions when implemented. The Lead Facilitator and Group Facilitators were told to play the role of passive observers and let the entire activity run at the hands of the groups themselves. They only stepped in to encourage the silent voices within the group to speak up or to nudge people to provide more clarity on what they were saying. All this while few designated Group Facilitators were taking active notes on the conversations that the groups were having. In the closing session we felt it was critical to summarize the discussions that had happened and emphasize that the identified top 5-6 issues had emerged through consensus and deliberation. The aim here was to make them take ownership of these issues and reiterate the point that the subsequent solutions would be centered on these very issues. In the closing phase we also handed out prizes to some of the best entries for the painting competition that we had arranged as part of the outreach. In addition we had the participants fill up a survey questionnaire to get a sense of their understanding of the proceedings and flag any issues that we may have missed. The workshops were conducted on Sundays and had a total of 48 participants across the three workshops. The top issues that emerged from the three workshops are in the below table. These issues eventually acted as the base upon which we built the subsequent modeling of the area that we will cover in our concluding post of the series. As mentioned earlier that towards the end of the session we also conducted a survey to gauge the understanding and satisfaction of the citizens about the whole workshop proceedings. 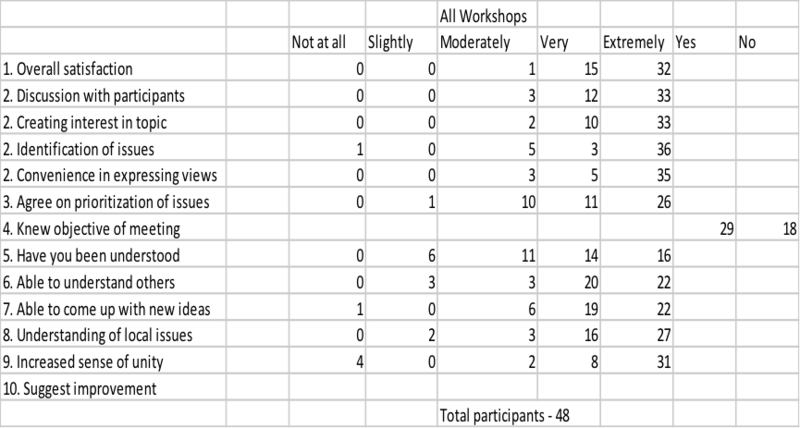 Results of which are in the table below. The post-workshop questionnaire for all the three workshops showed participants being satisfied about the process and the issues identified. However some of them indicated not being understood by others and quite a few of them mentioned not knowing the objective of the meeting. From amongst the workshop participants we identified a few individuals who volunteered to be our touch points for the subsequent modeling workshop that we had planned. In our next and concluding post of the series we will talk about the modeling workshop in greater depth and share our concluding remarks on the overall process. 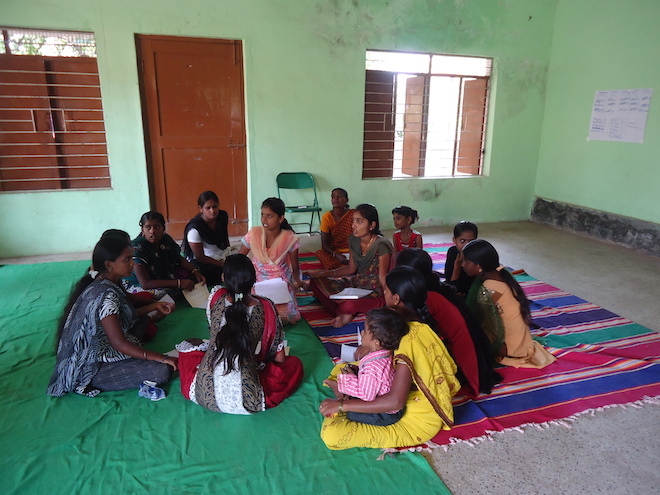 The emphasis on empathizing with the community, as part of the Design Thinking approach that we applied in Ranganatha Nagara, Srirangapatna, allowed us to deeply embed ourselves with the local residents in understanding their requirements and also helped develop familiarity with them. Such effort we believed would be a crucial ingredient in the run-up towards the community engagement workshops that we had planned. With an area that spanned 75 households, we thought it was best to conduct these engagement workshops at a granular level so as to arrive at a more inclusive and detailed understanding of how the residents envision their community’s future. 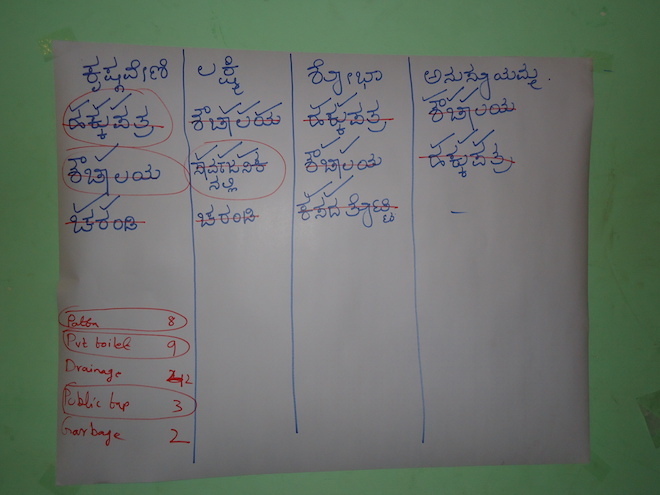 This required us to segment the households into three workshops that we had planned to conduct over a period of time. In the run-up towards each workshop we undertook a build-up process that in addition to inviting residents personally, was also aimed at priming the households about the upcoming workshop and its intent. The process allowed us to engage the households in a meaningful way about their aspirations and also was a opportunity to reach out to all sections of the society irrespective of their background. 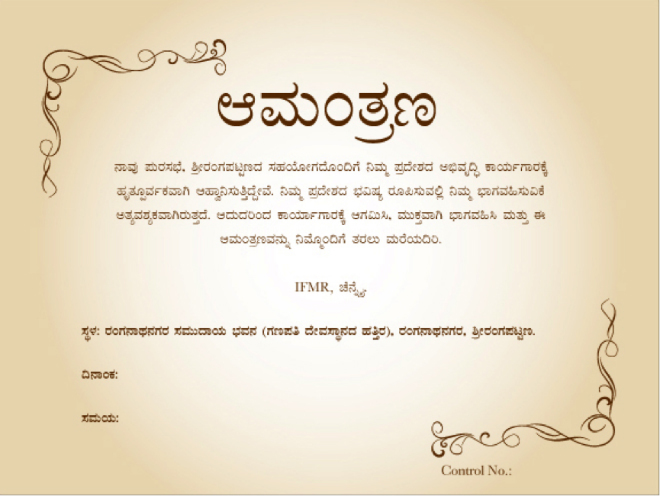 Presentation: We had prepared a presentation in Kannada that we ran through with each household. The presentation outlined who we were, what was our objective, and gave an overall sense about the process and how each household’s active participation could determine their, and the community’s future, in general. Largely visual, the presentation also included a case study of Hivre Bazar (Village in Maharashtra) about how the community got together and deliberated on issues that the community faced and collectively identified ways to address them. 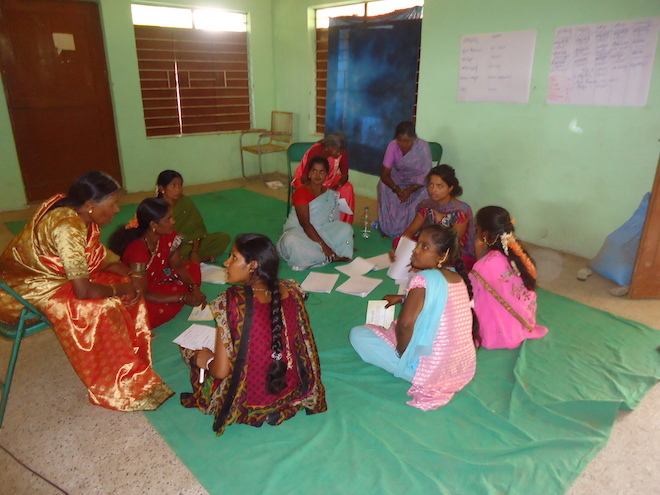 The intent with the vision sheet was to make the households think beyond their regular chores and in a way prep them up for the visioning exercise that was to follow as part of the workshop. Each filled-up vision sheet, which had a control number written on it that identified the particular household, would form the basis of the upcoming workshop. Painting Competition: We had also organized a painting competition as part of the build-up. The theme was “My Home” and each household, while being invited, was handed over a set of sketch pens and two A3 sheets. The idea was to create some buzz around the workshop and get the kids in the house excited about the competition. We planned to collect the drawings before the workshop began so that we could decide on the top entries for which prizes could be given at the end of each workshop. It was heartening to see the response the painting competition had generated and it was interesting that it wasn’t just the kids but also mothers who actively participated in the competition. We will cover the painting competition in a separate post later. For the workshop we had chosen a venue that was nearby to the locality so that residents didn’t have to travel much; in addition we had made stand-by transportation arrangements in case the elderly sought it. The invite was made in the local language and clearly outlined the venue, time and date of the workshop. The invite also had a control number that matched the filled-up vision sheet of the particular household. In the next post we will cover the discussions that emerged from the workshops. Having adopted a design-thinking approach and structured a model that we had outlined in the previous post, we embarked on to executing it in the Ranganatha Nagara area of Srirangapatna. One of the crucial decisions that we had to take was in identifying and training a team that, in consultation with us, would carry out the model on the ground. The choice of the team and how they are trained and whether they are able to understand the process well were, in hindsight, very important considerations that subsequent posts will elucidate. Earlier as part of our data generation process for the overall city we had engaged a group of local students. This earlier interaction resulted in the “State of Srirangapatna” report which was a result of a comprehensive data-generation process, that provided detailed spatial maps of Srirangapatna’s infrastructure both at the city level, and more granularly, at the ward level. Having worked with the same team earlier, we had developed a sense of familiarity with them and this made us choose a sub-set of the same group for the execution of the model this time. As part of Design Thinking’s initial stage where we endeavoured to deeply empathise with the community, we had deployed the local team to conduct a household survey of the area to understand details like demographics, occupation, income, infrastructure quality and access – housing, sanitation, garbage, water supply, daily routines and activity mapping. We had earlier covered this initial survey process and the training provided for the survey stage here and the results of the survey here. 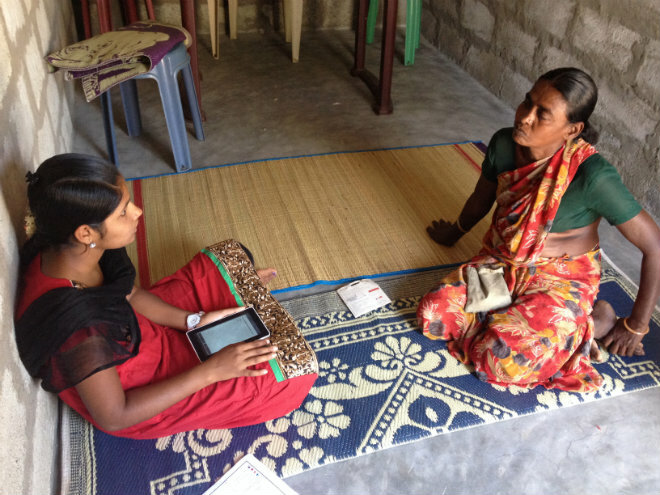 Unlike the initial survey stage where the team had to largely stick to a set of pre-defined questions on their Android tablets, the build-up stage of the model required them to build a sense of familiarity with the whole process and mandated that they have informed interactions with the residents. This step was critical since it would pave the way for rich, meaningful discussions that would enable people to look beyond their everyday chores and visualise their community’s future. 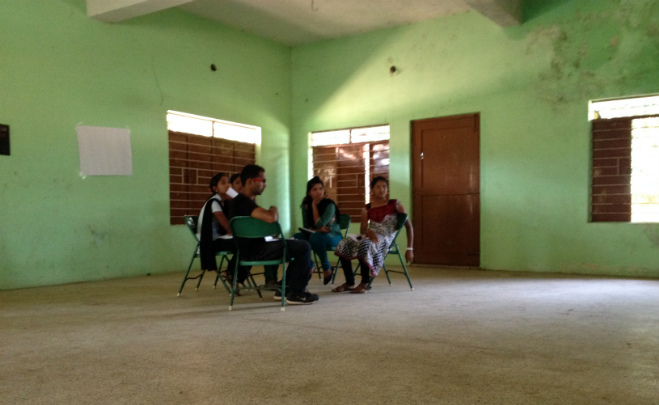 One of the critical barriers that we had as part of our interaction with the local team was language. We weren’t familiar with Kannada and being local students their grasp of English wasn’t perfect. Hence we had to be careful in our communications with them and had to ensure that nothing was lost in translation. Keeping this in mind we had prepared training material copies that we handed out to each of them and had allotted a couple of days to go through the training material in detail and familiarize them with the objectives and desired outcomes of the whole process. The training material detailed each step of the process and was reinforced with a set of expectations from the team at each stage. The training revolved around preparing the team for largely two stages of the Model – Build-up & Workshops. The build-up, stages of which we will detail further in the next post, was a crucial step in empathising with the community, as it gave a chance to visit the households at their doorstep and understand their aspirations better especially in the context of what the residents would like to change, preserve and create in their community going forward. We had the local team take turns in delivering the presentation – which we planned to give to each household with the objective of informing them about the whole process and how it could benefit them. Along with this, we conducted mock workshop sessions with the team so as to acquaint them with the mechanics of conducting an effective workshop and to reinforce how equally important the behavioural aspects in managing and interacting with people are. While the focus was on preparing the team to execute the model well and generate meaningful discussions among the residents, we realised, that being students they were facing a challenge in understanding some of the concepts and desired outcomes that we were expecting. In this regard we had to undertake a few sessions that were not related to the Model. Like for instance we had two team members interview each other about their families and future dreams and aspirations. Then we had each of them present to a larger group about what the other person had said. Sessions like these, though unconnected, did help in breaking the monotony and allowed the group to refocus on the task at hand. In the next post we detail the build-up process and outline our experiences from it. The previous post in this series discussed the design thinking approach and how it can be used to improve traditional urban planning methodologies. 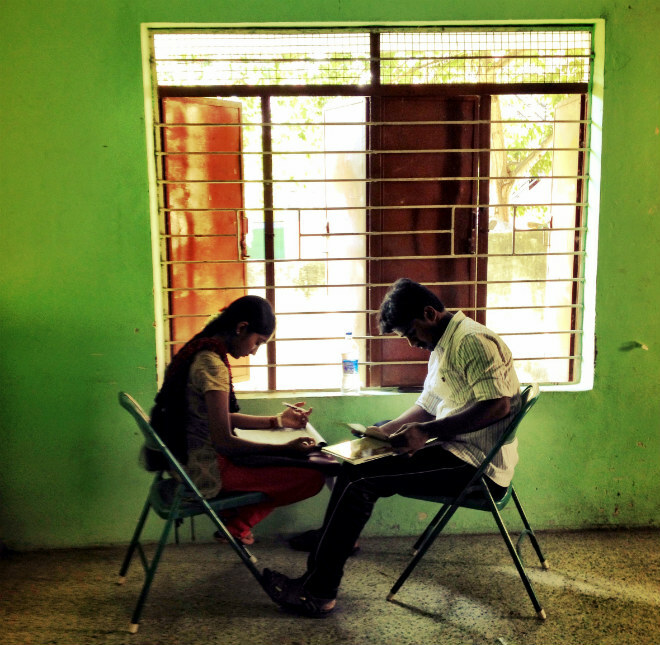 Keeping Design Thinking and the EDIPT process (Empathize, Define, Ideate, Prototype, and Test) at the core of our methodology, we designed a five-stage consultation or visioning process involving the citizens of Ranganatha Nagara, Srirangapatna. While this post provides an overview of the process, subsequent posts will delve deeper into each stage of the process. To collaboratively create a common vision for the future of Ranganatha Nagara and to use this common vision as the basis to draw out the long-term public infrastructures required to translate the vision into reality. To pilot a scalable process of community visioning, that can be deployed on a city-wide level. To evaluate the efficacy of a design thinking-based approach vis-a-vis traditional participatory planning approaches. a. What are the things you want to preserve in your community? b. What are the things you want to change in the community? c. What are the things you want to create in the community? Third, we conducted a painting competition on the theme “My future town”, primarily aimed at the children and students in the slum. 3. Visioning charettes: The visioning charettes were structured as two and half hour workshops that would enable the residents to collectively discuss the three questions that were posed in the vision sheet. The charettes aimed to go beyond the findings of the survey and arrive at a truer picture of the needs and aspirations of the community. Additionally, we wanted to arrive at a prioritization of the needs of the community which would be a critical ingredient in the designing of infrastructure plans. 4. Creation of a suite of infrastructure plans: For the purpose of creating a suite of infrastructure plans for the community, we reviewed visualization tools that were commonly used in participatory planning. While traditional visualization tools using paper maps, photographs, and physical models offered simplicity and the ability to engage participants with ease, we decided to use SketchUp, a three-dimensional modelling software, to create infrastructure plans. In this, we were motivated by two primary reasons: one, three dimensional modelling allowed us to create a range of infrastructure plans efficiently and enabled us to visually convey the changes that the community would undergo. For example, by creating custom-made “walk-through” street visualizations for each infrastructure plan, we were able to provide the residents with a powerful and realistic approximation of the future of their community. Second, three-dimensional modelling also presented us the opportunity to actively engage the residents in the designing of the plans. For example, during the evaluation of infrastructure options, we were able to offer the residents the opportunity to suggest changes to existing plans and to instantly see the effect of that change by modelling them during the workshops. This allowed us to gain constructive feedback on the plans and enabled us to undertake further refinement. 5. Evaluation of options and consensus building: At the end of the visioning charettes, we formed a council of volunteers, with whom we could have a more granular discussion on the infrastructure plans. This representative council would provide detailed feedback on the suite of infrastructure plans and help us in improving and finalizing a design solution for the community. In order to test the efficacy of a design thinking based process, we also created a “pre-empathy” infrastructure plan- a plan that was modelled entirely based on the inputs provided by the household survey. This model was built as a counterfactual to mirror traditional planning approaches that rely less on inputs from the community. By integrating this plan in the suite of options provided, we would be able to measure the preference of the community for a particular model and thereby, test the efficacy of the process. Additionally, we also administered a survey to measure participant satisfaction and ownership of the process. 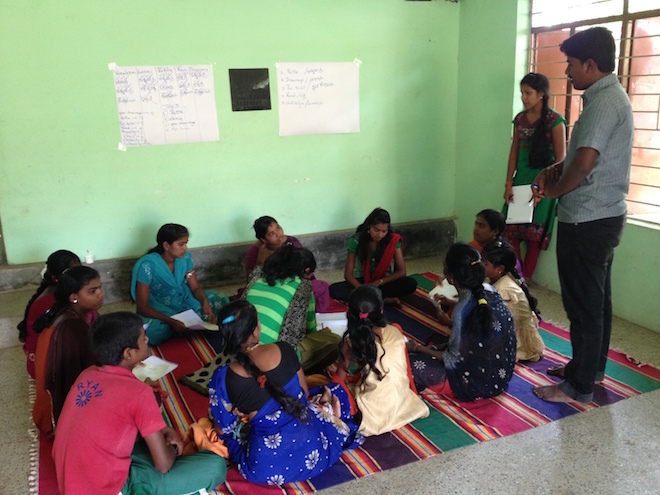 In the next post we dwell deeper on how we assembled and trained a local team of students as part of the process. 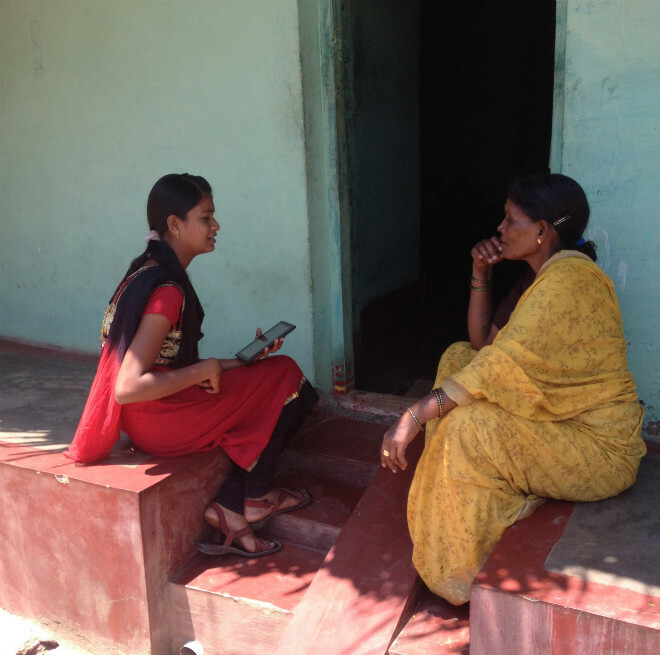 The previous posts in this series summarized our efforts to collect granular data on the quality of infrastructure services provision in Ranganatha Nagara. Our objective now was to use this data as a platform to initiate a conversation with the residents of Ranganatha Nagara on building a collective vision for the future of the neighborhood. In this process, we are guided by the framework of design thinking. Design thinking refers to the application of a discipline that tries to understand human behaviour in order to develop or improve products or services. As opposed to customary approaches that rely excessively on analyzing and answering questions by working out the last detail, the design thinking paradigm is centered on collaborative experimentation and rapid prototyping. This approach has traditionally been applied to the realm of product development, as the example below tries to illustrate. IDEO, a design and innovation consulting firm, pioneered the practice of design thinking through the creation of a new shopping cart concept. First, a team of designers interviewed a wide range of stakeholders including customers, cart movers and shop keepers to understand their shopping experience, usage patterns, and actively probed their problems and invited suggestions. Second, after ‘empathizing’ extensively with the users in this manner, the team members were able to collectively define and ideate on solutions to the most pressing problems- maneuverability of the shopping kart, child safety, theft and maintenance cost. Third, using this shared understanding, the team then designed four initial prototypes. The team then coalesced best elements from each prototype into a single design and took this back to users for a round of testing. Fourth, the users reviewed the prototype and provided the team with feedback. For instance, the design of steerable back wheels that enables the cart to be turned sideways with ease was praised. However, some shopkeepers felt that the prototype lacked adequate features for deterring theft. Finally, this feedback was fed into another round of ideation and prototyping before the design of the cart was finalized. 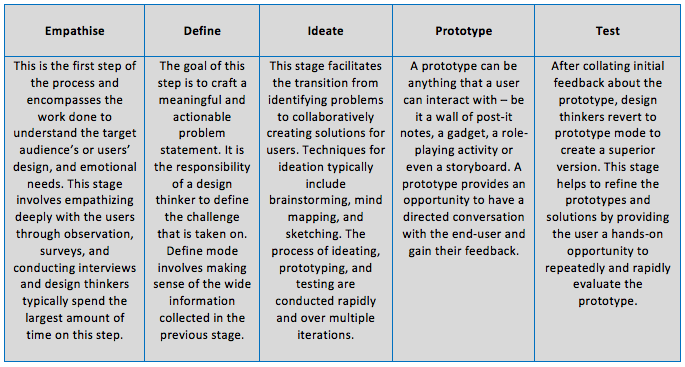 The design thinking process, thus, involves five stages as illustrated in the figure and table below- Empathise, Define, Ideate, Prototype and Test (EDIPT). 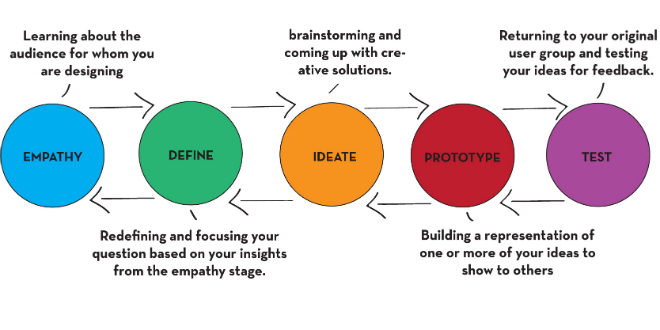 As is evident from the example, there are three key features that characterize design thinking. First, it is a human centric process in that it puts the users or customers, and their needs at the heart of the process. Second, as illustrated in the example above, design thinking is an iterative process that motivates teams to transition between problem defining, ideating, prototyping and testing (feedback from user). This iterative process is at the core of what leads to a better final outcome. Third, by empathizing and rapidly creating and testing prototypes, the process allows end-users to participate in the process right from the initial stages. How can Design Thinking be applied to urban infrastructure planning? 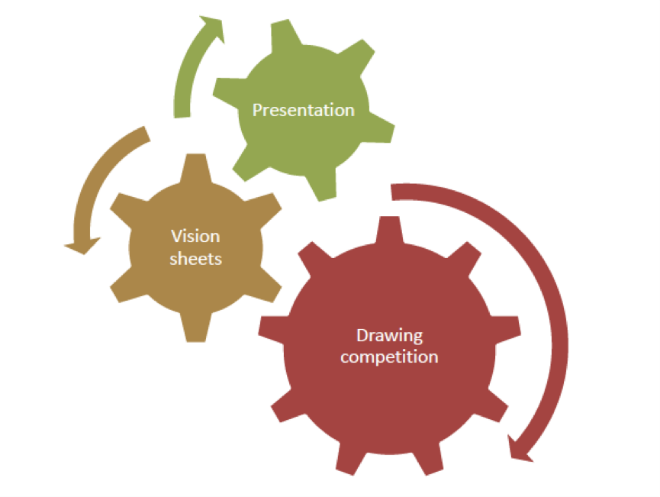 Traditional planning methodologies rely heavily on top-down approaches- the plans are first made and strategized, and only then are the citizens informed about it. These plans are usually made without involving the citizens in the process, and as a result, often fail to reflect the problems faced by citizens on the ground. Consequently, citizens naturally have a lesser degree of ownership of these top-down plans and responsibility towards maintenance of public infrastructure. While participatory planning approaches seek to address these gaps by working with the citizens in understanding their problems, they rarely ‘close the loop’ by seeking feedback from the citizens after the plan is prepared. Thus, the ownership of the plan by the citizens is not guaranteed. Additionally, this also precludes any further refinement of the existing plan. Design Thinking provides us a framework to overcome the flaws of the traditional participatory planning approaches in the following ways- first, design thinking enables the creation of an infrastructure plan that places citizens at the heart of the process. 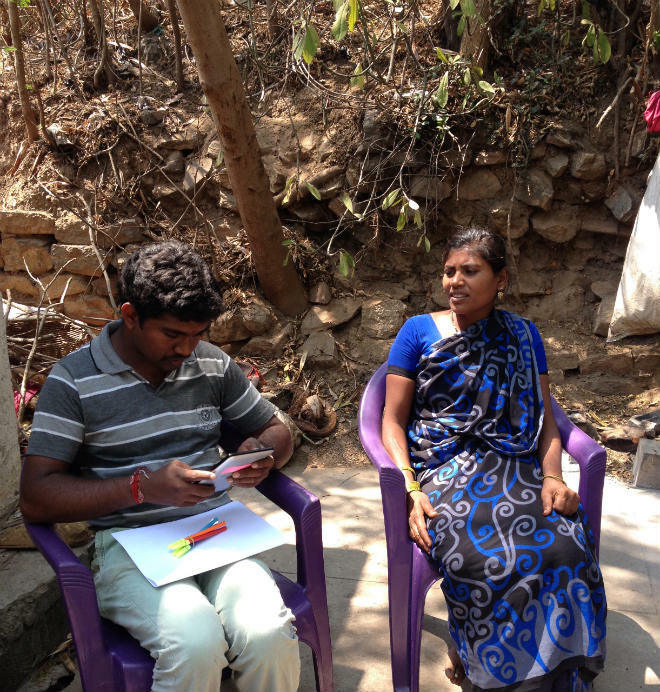 A process of deep empathising (through household surveys, interviews, and charettes) will enable the development of a granular understanding of the problems faced by citizens. Second, the design thinking method also facilitates a process of refinement of the plan through continuous prototyping and testing. We are using the EDIPT process to collaboratively ideate and iteratively develop an urban infrastructure plan for one neighbourhood in Srirangapatna, namely Ranganatha Nagara which is the largest slum in the town. 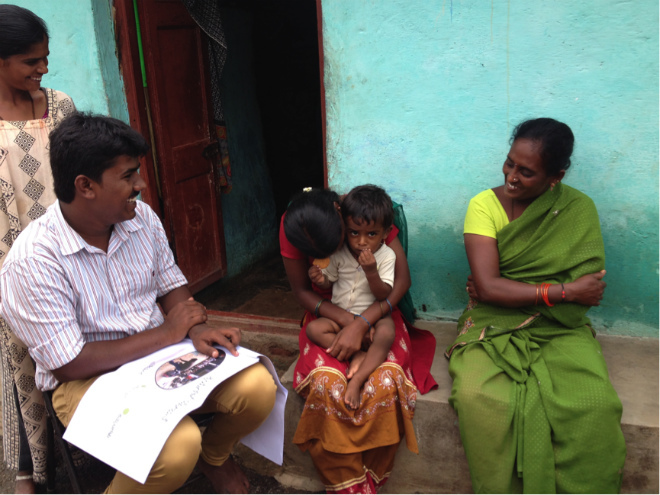 The data collection exercise that we had covered in an earlier post as part of the slum engagement process was the first in a series of steps that we would embark on in envisioning the future of Ranganatha Nagara 2 Slum in Srirangapatna. The survey questions which spanned capturing details like demographics, occupation, income, infrastructure quality and access to basic services were meant to help us understand the community better and equip us in having more informed conversations with the residents about their future needs. The uniqueness of the survey was that the data was collected using an open source tool called Open Data Kit (ODK). We designed an excel sheet using ODK’s XLSForm and uploaded the form into our Android devices. Our volunteers then went on the field with the devices and recorded the answers from each household. The collected data was stored on our local server which we then downloaded as a single excel file for analysis. A lot of time was saved in the process because we did not have to manually fill the answers in excel; also it helped eliminate the need for paper. Ranganatha Nagara 2 seems to be strong in electricity coverage, healthcare availability, and school enrolment of kids aged between 5-18. 83% of the households are satisfied with water supply services and 85% consider the water they consume to be safe. Sanitation is clearly an area of opportunity as only 7% of the houses have toilets while the rest defecate in the open. Housing seems to be an issue since 56% of households have reported a leakage through the roof. 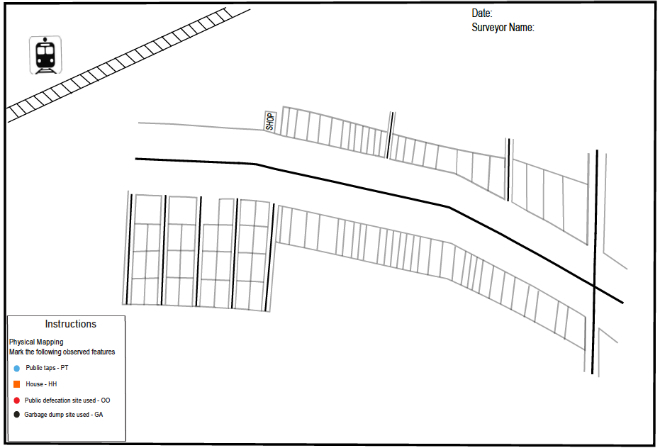 Currently the slum has an open drainage network and 83% of households reported being not satisfied with it. There is also an opportunity to increase the availability/usage of designated garbage cans as 81% reported not using or not having access to them. In subsequent posts we will lay out an introduction to “Design Thinking” philosophy that will drive our approach to the slum engagement process. 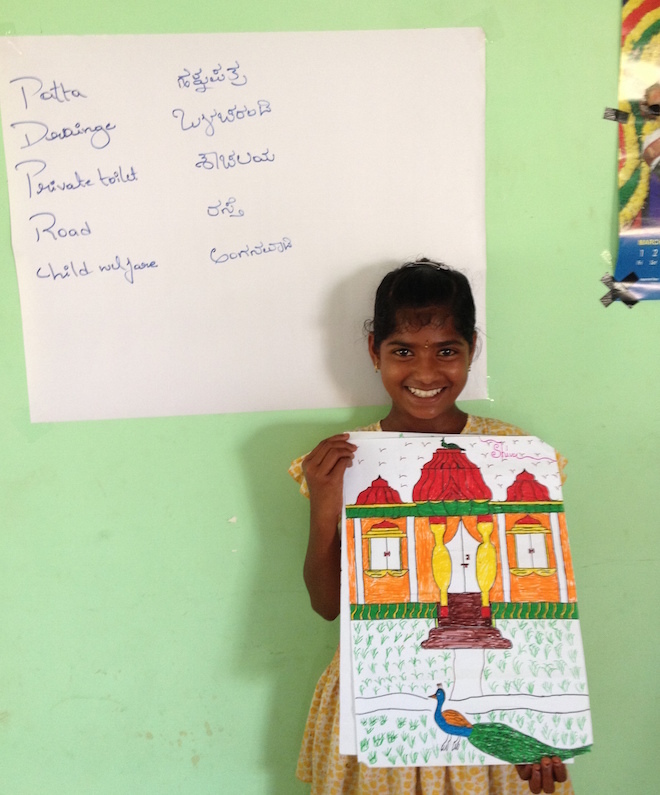 We have been working with the town of Srirangapatna, a town with a population of about 25,000 people, to create a long term plan for infrastructure development. This work is predicated on the realisation that small and medium cities should be able to plan for and sustainably finance their future in a manner that makes urban development evenly spread out and not concentrated to large urban hubs – which are witnessing tremendous strain on their already crumbling infrastructure. Towards this end we had prepared a State of Srirangapatna Report, which captures the current state of public infrastructure and service delivery in the city. The report provides a ward-by-ward analysis of infrastructure and also attempts to rank wards based on the state of their public infrastructure. The Ward ranking exercise made it apparent that wards with slums in them ranked much poorly compared to the wards without. Additionally it became clear that the conditions and challenges that prevailed in a slum are different from the non-slum parts of the ward around it, and therefore the development of any sustainable plan for the city had to be nuanced enough to cater to the uniqueness that slums represented. In order to achieve this understanding we embarked on creating a sustainable slum development framework that we believe will be capable in catering to the needs and aspirations of slum-dwellers and allows them a stake in designing the city’s future. In this regard we worked with the local municipal office and identified the least developed slum in the city to work with. The slum, Ranganatha Nagara 2, is the poorest of all the slums in the city. The slum has 75 households with a population of 283 people. 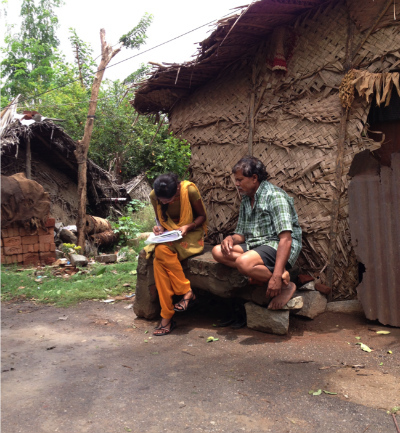 As a first step to working with the slum we decided to conduct a thorough household survey of the slum residents, spanning details like demographics, occupation, income, infrastructure quality and access – housing, sanitation, garbage, water supply, and household daily routines and activity mapping. Unlike our previous household survey of the city that involved usage of good old pen and paper, this time we used technology for data collection. Our tools of choice happened to be Android powered tablets equipped with the ODK (Open Data Kit) app. The intent was to make the whole process seamless and save on the lead-time that it takes to convert physical surveys into digital format for analysis. Briefing them about the slum engagement process that we had planned and how the data collection exercise they would be embarking on is a first and vital step towards that. Handing each of them a physical copy of the questionnaire and a slum map that they could familiarize themselves with and carry along. As the survey questions were in English, it was essential that we ensured that surveyors understood them well. 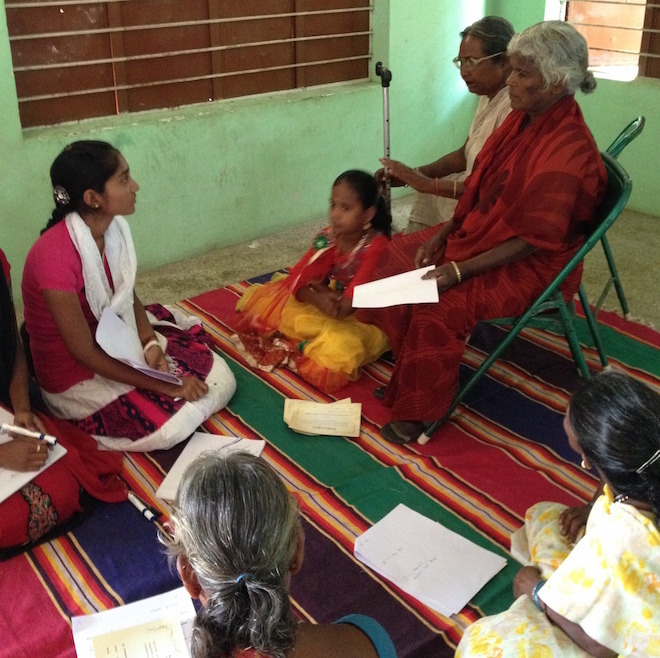 We had a local resident, who is well versed in both English & Kannada, accompany us through the training session. She translated the questions and the options and acted as a valuable interface in clearing any queries that the surveyors had. This was followed-up by conducting a group mock survey on the ODK app with selection of various yes/no scenarios. We then handed each of the surveyors their designated Android tablets with their name labelled at the back of the device and let them conduct a mock survey as if they were doing their own household survey. While we handed over the tablets with the ODK app pre-loaded, we also trained them in basic navigation of the tablet in case they accidentally came out of the app. We later accompanied the surveyors on a physical walk-through of the slum so that they could orient the landscape to the slum map. Also the intent was to allocate them the designated sections that they would be covering. Later we let the surveyors conduct a few household surveys that we closely monitored and later reviewed to give specific feedback. In the next couple of days a team of total 5 surveyors covered the entire slum ensuring no household was left out of the survey. 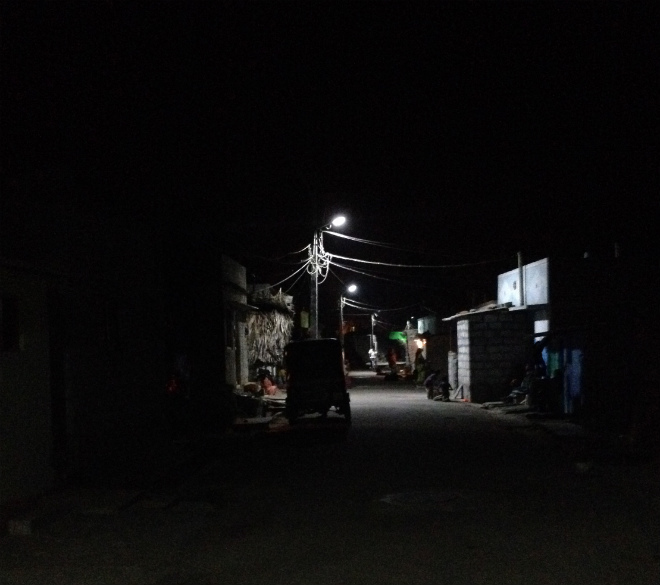 While undertaking the surveys we realized that a lot of houses in the slum were locked in the morning and the residents usually got back in the night. This was usually because most of these were daily wage labourers and left their houses early. 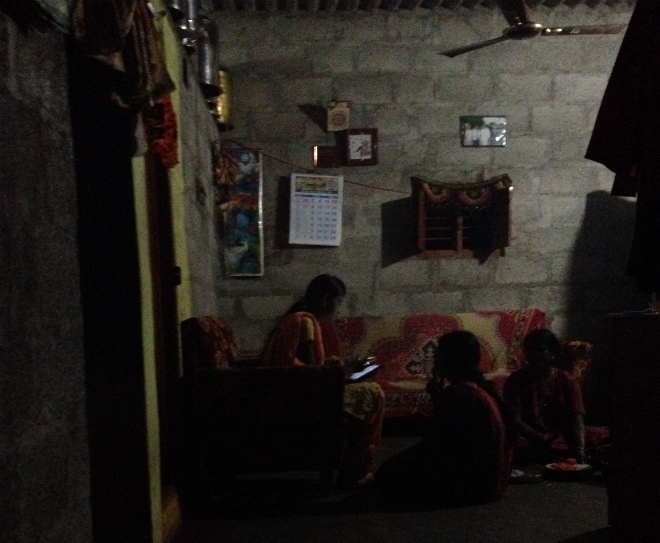 To capture these households we revisited the slum in the night to capture them. During the span of the surveys, our initial sense about the challenges of a slum being different from that of the ward in general, were reinforced through some of the stories that emerged. Like that of Mr. Suresh, whose life’s aim is to get a patram (title deed) of his about 100 sq.ft house that he lives on along with his wife and two daughters aged 2 & 4. For this he has been scrambling for the past 3 years from pillar to post but with little progress. 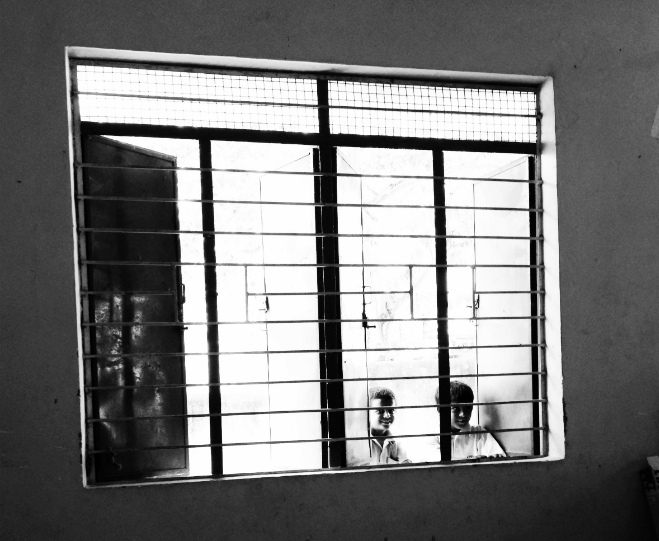 Or the story of Ms. Shobha, a labourer, whose husband, a leprosy patient, is a beggar outside a church in Bangalore. Earning about Rs. 3000 a month doing odd jobs, she struggles to make ends meet but still somehow manages to send her two daughters and a son to school. 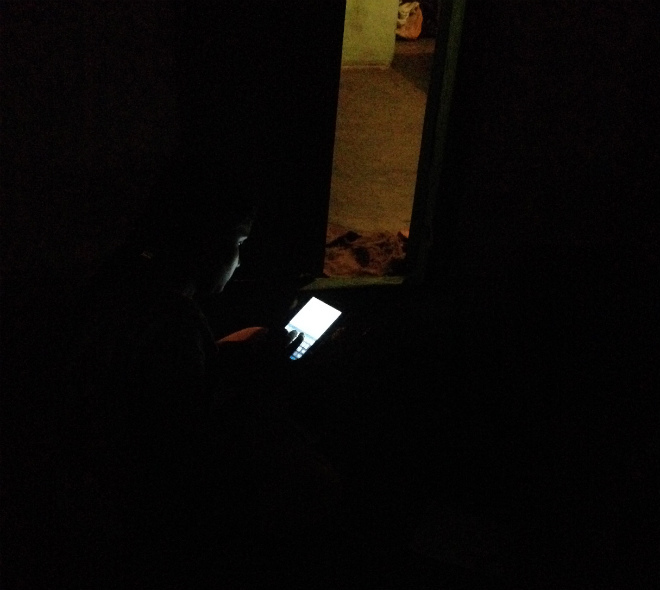 Beyond the data collection, these were stories of hope and helplessness that cropped up time and again. This data collection process is the first step in the slum engagement process and will be followed up in the coming months with workshops with the slum residents to collectively envision and plan the slum’s future. We will share the progress on these workshops and the visioning tools deployed in subsequent posts. We are working with the city of Srirangapatna on developing a long-term vision for basic infrastructure development and in designing financing mechanisms to sustainably finance this development.